My recent post on demographic myths unleashed a lively discussion on the issue of race and IQ in the comments section. I’m not too interested in wading into it: not out of any misplaced respect for political correctness, of course, but simply because though I think there are good arguments for both sides, it misses the largest issue. On the one hand, that there exist differences in measured IQ between races in the US and between nations is beyond dispute, and there is strong evidence to suggest that IQ is a strongly hereditary trait. On the other hand, one must also keep in mind that culture plays an indelible role on the formation and very definition of IQ. One striking demonstration of this is a “similarities test” administered by Michael Cole on members of the Kpelle tribe in Liberia, in which they were asked to group objects into categories such as food, tools, etc. They chose functional pairings – e.g. knife and potato, because a knife could not not cut a spoon – because a “Wise man could do such-and-such”. It was only when the researchers asked “How would a fool do it” that the tribesmen rearranged the items into their “correct” categories. So can the Kpelle really be called dumb? Isn’t their form of intelligence, though demented in the eyes of industrial man, actually eminently suited for their natural environment? However, once upon a time, European peoples too had this psychology. Throughout the world the illiterate peasant tended to be dull, uninquisitive, childlike. (In stark contrast to the slick, lettered, cosmopolitan city-dweller). For instance, in an earlier post I mentioned the article Reconsidering Weber: Literacy and the Spirit of Capitalism by Russian sociologist Andrey Korotayev. Literacy does not simply facilitate the process of perceiving innovation by an individual. It also changes her or his cognition to a certain extent. [A study by Soviet psychologists on Central Asians during the 1930’s] shows that education has a fundamental effect on the formation of cognitive processes (perception, memory, cognition). The researchers found out that illiterate respondents, unlike literate ones, preferred concrete names for colors to abstract ones, and situative groupings of items to categorical ones (note that abstract thinking is based on category cognition). Furthermore, illiterate respondents could not solve syllogistic problems like the following one – “Precious metals do not get rust. Gold is a precious metal. Can gold get rust or not?”. These syllogistic problems did not make any sense to illiterate respondents because they were out of the sphere of their practical experience. Literate respondents who had at least minimal formal education solved the suggested syllogistic problems easily (Luria 1974, 1976, 1982: 47–69). So, 1970’s Kpelle = 1930’s Central Asians? Now fast forward to today. Many Central Asians are Turkic, and their level of social development – if not economic development (due to an adverse geography and a socialist legacy) – is similar to Turkey’s. The Turks are estimated to have a national IQ of 85–90; not retarded, but substantially less intelligent than average Europeans and East Asians. For instance, the IQ of the US is estimated to be around 10 points higher. But if American children during the 1930’s had taken the IQ tests of the 1990’s, it is estimated they’d have performed about 20-25 points lower (that’s like today’s India or Brazil, or 10 points lower than Turks)! This is explained by the rapid secular rise in intelligence during the past century called the Flynn Effect. Such an increase is beyond the power of genetics. According to Flynn – and I find this to be convincing – his effect can be ascribed to the environmental changes produced by modernization and the industrial system. He cites the following example: in response to the question “What do a dog and a rabbit have in common?”, whereas a modern respondent would say they are both mammals (abstract answer), someone from a century ago might say that one would catch rabbits with dogs (a concrete or functional answer). It would appear that it’s not so much general IQ that has improved – though probably it did too thanks to better nutrition – but the specialized IQ (abstract, categorizing) that is needed to sustain an industrial system. But I’d prefer to imagine it in the following way. Think of the brain as hardware. Just as human races* possess various skin colors and physiologies that have evolved over eons in their environments, so it is likely that there appeared subtle racial variations in the genetic component of intelligence. To take a (very idealized) example, it would seem intuitive that someone descended from “hunters” would have a predilection for motor skills (to chuck spears at prey), while someone whose distant ancestors were “gatherers” would be relatively more adept at pattern recognition (to notice berries and be able to tell which are poisonous and which are not). Nonetheless, three factors would mitigate these differences. First, the human species is very mixed and interbred; apart from small groups that spent a long time in isolation (such as the Tasmanian aborigines), inter-racial distinctions are unlikely to be very sharp. Second, the brain’s hardware works much more effectively if properly maintained; to that end, improvements in nutrition would have the effect of raising IQ levels, especially from the lower end of the scale (as indeed happened in the US during the 20th century). Third, and most importantly, the actual software of intelligence – the intangible of culture and memetics, which is a product of an (ever-changing) environment – has been evolving far, far faster than the hardware. Whatever their racial differences, a Gaelic office worker has far more in common with an ethnic !Kung physicist living in Ireland (mentally, psychologically) than with his own ancestors of a mere century ago. Furthermore, the link between modernization and IQ is not one way. 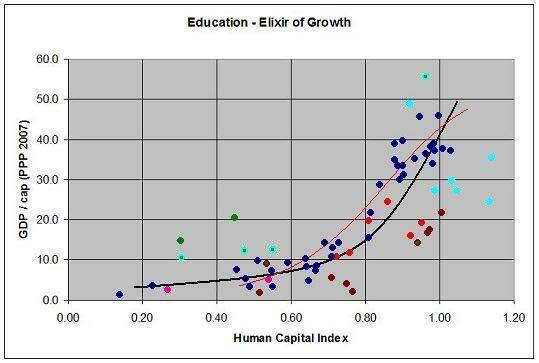 The main determinant of long-term economic growth is a country’s human capital (see 1, 2, 3), which for the most part consists of the educational attainment of its population, which in turn is strongly correlated with its level of national IQ**. China is the biggest creditor and set to become the world’s biggest manufacturer in 2011; though its level of tertiary attainment is still low, it has good basic education and a high national IQ. 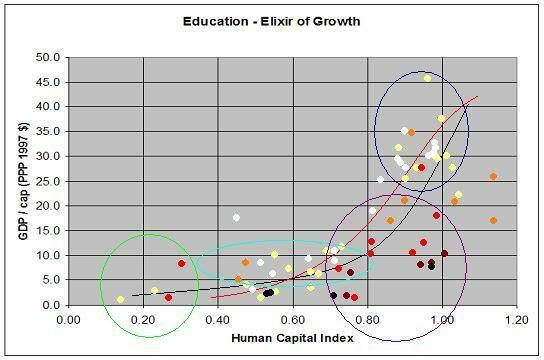 Russia has superb human capital, energy windfall and fiscal firepower. Similar things can be said for most of the rest of Eastern Europe, East Asia and Eurasia. Many Indians remain functionally illiterate; though Brazil has progressed further, international standardized tests confirm its woeful educational standards. Similar things can be said about most of the rest of Latin America, South Asia, the Middle East and Africa. These regions are unlikely to converge to developed levels anytime soon. In the West itself, the Flynn Effect has stalled and may even have gone into slow retreat – in any case, human capital development is no longer a driver of growth. Meanwhile, it faces many challenges, such as fiscal (un)sustainability and aging populations. It will remain near the theoretical upper boundaries of development, but these boundaries are likely to start contracting in the years ahead under the pressures of energy depletion. None of this is due to the fact that Estonians or Chinese are “superior” to Indians or Germans. These are deep structural factors we’re talking about. Quite simply, unlike Mexicans, the former have the type of culture, education, IQ (call it what you will) that will enable them to sustain a developed techno-industrial base. According to the results of the PISA 2006 standardized tests in science, only 15% of Brazilians, 11% of Indonesians, 18% of Mexicans and 22% of Turks possessed skills beyond those needed for purely linear problem-solving, in contrast to 40% of Israelis, 48% of Russians, 51% of Americans, and 68% of Koreans. In other words, the latter nations have about 2-5x as many cadres capable of moving into hi-tech and high added-value manufacturing or services as the former. Is it really a logical leap then to consider their long-term development prospects that much brighter? Likewise, the reason that Russians and Chinese will gain on Germans and Americans is also simple – the former have the capacity to absorb modern productivity-enhancing technologies, whereas the latter are already developed. This is just catch-up growth. Interestingly, I suspect that their catch-up will be very rapid in historical perspective due to 1) the economic waning of the Western world due to unsustainable fiscal policies, debt and rising costs of energy inputs and 2) the unprecedented ease of technology transfer (and theft!) bequeathed by the Internet. In the near future, there will appear definite limits to further growth of the global techno-industrial base. Consequently, in a globalized world in which capital resources flow to where they can produce the greatest returns, we can expect nations like China to expand their share of global manufacturing to levels commensurate with their skilled industrial workforces. In fact, this seems to have been the case in the oil shock-induced crisis of 2008-2009: for instance, whereas global vehicle production fell by 14%, it expanded by a blistering 48% (!) in China, which now accounts for nearly a quarter of world output. * Yes, I realize some scientists deny race and prefer to talk of genotypes, phenotypes and clines. For the sake of clarity, I’ll use the term “race” with the understanding that it is highly qualified. ** See my first post Education as the Elixir of Growth for the original argument. I didn’t bother connecting education with national IQ there, though I was familiar with their close relation, because I didn’t want to incite controversy. (Now I realize that’s a bad idea for a popular blogger!). In the last comment Steve Sailer made the connection explicit.